Spray 15x12-inch sheet of foil and 13x9-inch (3-quart) glass baking dish with nonstick cooking spray. In large bowl, combine tomatoes and taco sauce; mix well. Stir in chicken. In medium bowl, combine refried beans and sour cream; mix well. Spread about 1 cup chicken mixture in bottom of sprayed baking dish. Top with 4 uncooked noodles, breaking to fit if necessary. Spread with half of bean mixture and 1 1/2 cups chicken mixture. Sprinkle with 1 cup of the cheese, half of the onions and half of the olives. Layer 4 more noodles, remaining bean mixture, 1 1/2 cups chicken mixture and 1 cup cheese. Top with remaining 4 noodles, chicken mixture, onions, olives and cheese. (Be sure top noodles are covered.) Cover with foil, sprayed side down. Refrigerate at least 8 hours or overnight. Heat oven to 350°F. Bake covered lasagna for 50 minutes. Uncover baking dish; bake an additional 18 to 22 minutes or until bubbly and thoroughly heated. Let stand 10 minutes before serving. Sprinkle with cilantro. If desired, garnish each serving with dollop of sour cream, chopped tomato and shredded lettuce. For more heat, purchase diced tomatoes with hot green chilies. Purchase 1/2-inch-thick slices of cooked chicken from the deli and cube the slices for the 3 cups needed in this recipe. 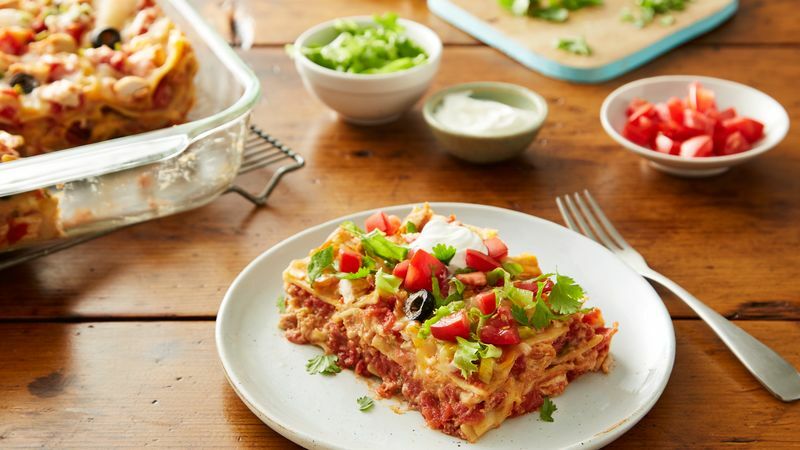 Serve warm flour tortillas and sliced mango or papaya with this lasagna.